This script allows you to create reference pages for your events. 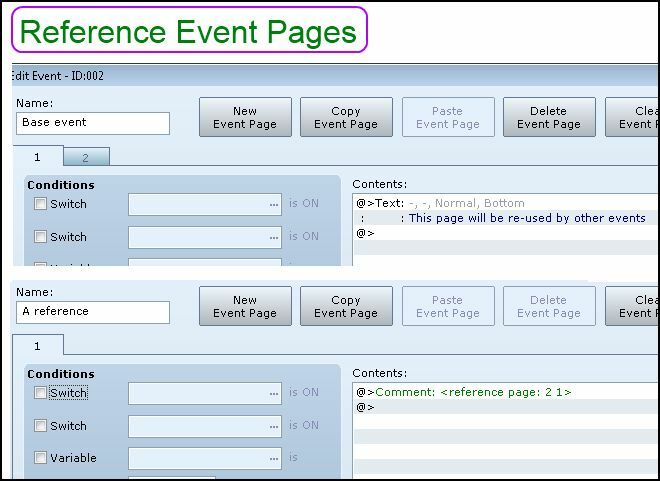 A reference page allows you to create one page and then re-use it in different events or troops. This can be applied to troop events and map events. For map events, the reference page will copy the event commands, page conditions, page graphic, as well as any other page settings. Troop events can only reference other troop events. Similarly, map events can only reference other map events. on the same map as the current event. You can have a troop event page reference any other troop event page.